I know what you're thinking. The "Last Resort" sounds like I've given up on something and am about to succumb to a desperate act, possibly because of the difficulty in trying to come up with something new about which to blog every day, particularly while I've been under the weather. True, it does sound that way, but it isn't really. Seriously. This is the LAST RESORT. Just in case you weren't sure. Today is the first day in most of two weeks that I have felt relatively normal. I woke up with no scratchy throat, no excessive phlegm (I'm sure you're all grateful to know that), and only minor allergy brain. I can once again sing without hacking, at least for a while. So that's good. I decided to celebrate by going out to eat, particularly since the hubs had band practice and wasn't planning to be home for dinner. 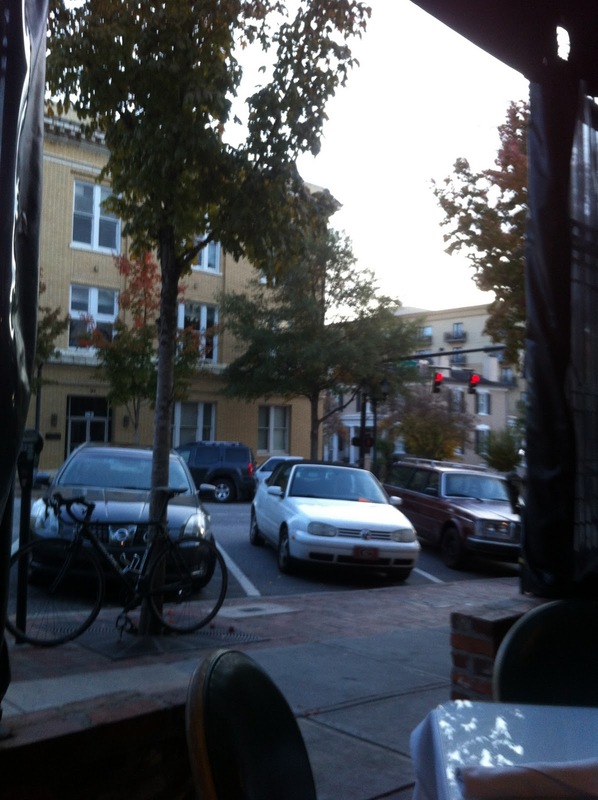 View of the street from the covered patio. I chose to go to my favorite restaurant here in town, a place called the Last Resort Grill. It's downtown near the local university and is an awesome little place with an outdoor patio, subdued lighting, and amazing desserts. It's also very popular; if you don't go pretty early you can end up waiting 1-2 hours most nights. On the walls is a rotating display featuring the work of local artists for sale. Sweet tea, mixed green salad, and fresh bread. Also, a glaring iPad with my current book on it. I like to go with a book and sit on the patio where I can watch people walk by on the sidewalk in nice weather. Unless there is something particularly awesome on the specials, I usually order the "Firecracker Filet," subbing out the asparagus spears for grilled corn. Tonight's filet, complete with mashed potatoes and rosemary compound butter, was excellent as usual. Yummy steak with the World Trade Towers rendered in corn. After the meal, I sprung for a raspberry cheesecake. All of the cakes and cheesecakes for Last Resort (as well as several other restaurants in town) are created by the inimitable Cecelia Villaveces of Cecilia's Cakes. 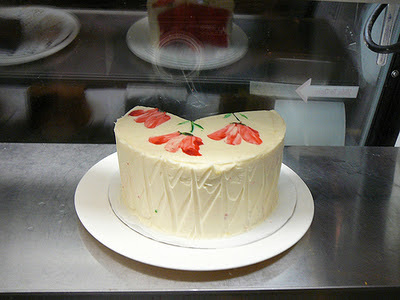 Cecilia is especially well known for her famous Red Velvet cake, which has hand-painted flowers on it. My daughter, who loves red velvet (unlike me), says it's one of the best--if not the actual best--red velvet cake she's ever tasted. raspberry cake, which I also often get. I loves me some raspberry flavoring. It was a good evening...very quiet and peaceful, with lots of good food, a good book, and a snobby college girl next to me speaking condescendingly to her friends about her French major. Ah, college. It's days like this that I'm glad I'm no longer 20 and excessively full of myself.